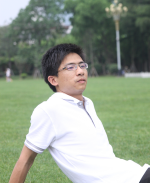 Zutao regards himself as a researcher who is related to ecological informatics or environmental informatics. His research focuses on using remote sensing techniques, GIS, and mathematical and statistical tools to explore existing data to discover solutions for environmental and ecological problems. In the near future, he plans to continue research in synthesizing data from different sources with wavelet analysis, classical and bayesian statistics, and computer models/simulations in an effort to study the driving factors of the water and carbon fluxes of Lake Erie and the interaction between social, economic, and natural factors in human-nature coupled systems.